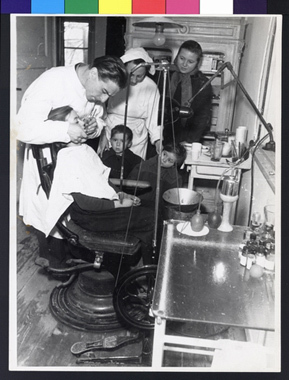 JDC - Archives : A visit to the dental technician at DP Camp Neu Freimann is required before leaving for Israel. Title A visit to the dental technician at DP Camp Neu Freimann is required before leaving for Israel. Description A visit to the dental technician is another step in the pre-emigration routine that all Jewish DPs must go through prior to leaving for Israel. A refugee family undergoes a dental examination before their departure.